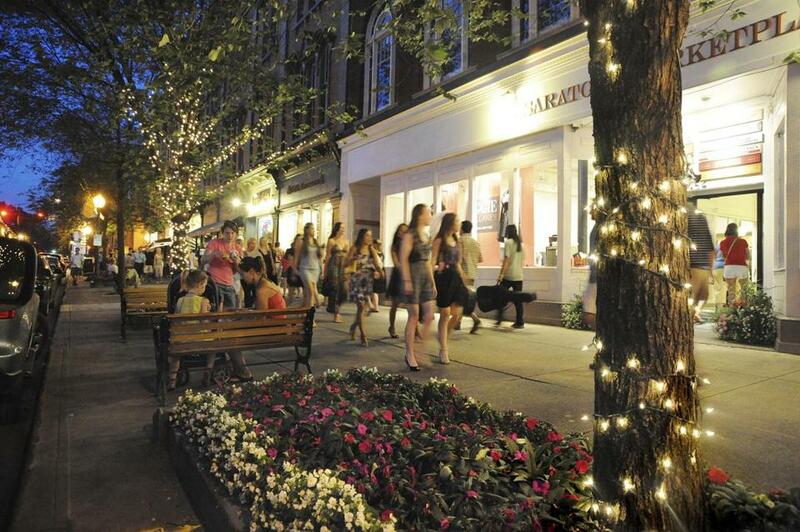 Downtown Saratoga Springs bustles day and night during the summer. Midsummer travelers to this upstate New York town come either for the waters and stay for the horses, or vice versa. It’s a winning perfecta regardless, as Saratoga Springs delivers both spa days and race days with equal finesse. A perennial destination of the affluent and the artistic, it still retains an almost Rockwellian air, especially the Broadway district. The historic brick and stone edifices house a parade of restaurants and curiosity shops that are as inviting as the possibilities a bit farther afield. atsaratoga.com, $147-$359) has been welcoming guests since 1843. Each of the 42 well-appointed rooms comes with Wi-Fi, a buffet breakfast, and cordial service. (1 Caroline St., 518-587-2026, www.onecaroline.com, $14-$28) pairs organic, locally sourced specialties, such as wild boar ragu,with live jazz and local acts nightly. .com), which sells first-edition Twain and other rarities, and Saratoga Olive Oil Co. (484 Broadway, 518-450-1308, www.saratogaoliveoil.com, bottles $10.95-$18.95), a sampler’s delight that offers tastings of oils and vinegars infused with fig, chipotle, violet, and other enticing flavors. saratoga.com, drinks $4-$15) for drink specials and smooth music at the upscale 19th hole of this top-rated golf club.